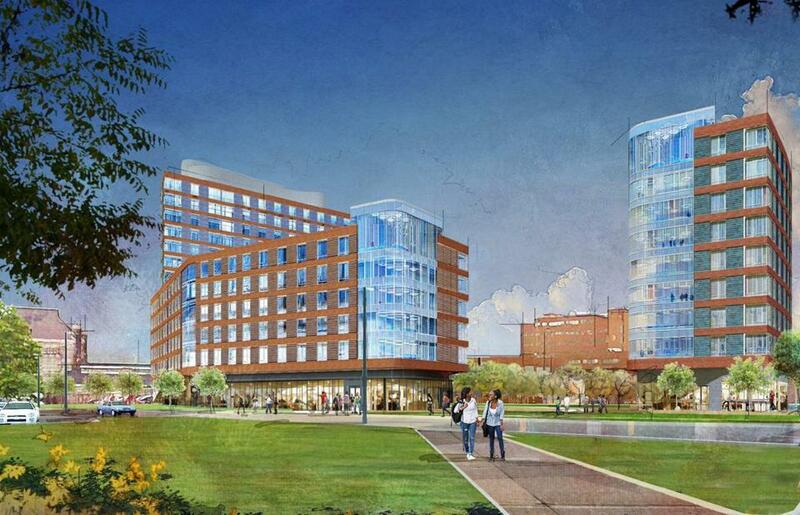 An architect’s rendering of the residential complex, which would house 1,000 students. In a first for the bustling commuter school, the University of Massachusetts Boston expects to open a 1,000-student dormitory complex on its Columbia Point campus in September 2018, university officials said Thursday. “This is a major milestone in the history of UMass Boston and a significant accomplishment for the university as a whole,” said Martin Meehan, president of the university system, in a statement. The two-building, $120 million facility will accommodate freshmen and transfer students. Construction on the 260,00-square-foot complex is expected to begin this fall in what is now a parking area at the end of Mount Vernon Street near the Clark Athletic Center. The dormitory represents a new direction for the campus, which had long been plagued by aging and neglected buildings. University officials hope that the addition of on-campus housing will raise the institution’s profile with potential out-of-state applicants. Past proposals to build dormitories have been criticized by neighboring civic groups. Mayor Thomas M. Menino clashed in 2003 with the university over plans to build residences for 2,000 students, although he dropped his opposition when a long-term master plan was released in 2007. Menino said then that university officials had done a better job of seeking out and adapting to neighborhood opinion. Mayor Martin J. Walsh supports the plan, which addresses what he has called a citywide need to add more dormitories for students who have been forced to live off-campus in substandard housing. Sheila A. Dillon, Boston’s chief of housing, lauded the UMass project, citing the city’s real-estate crunch. “While we certainly need to create more student housing so that more moderately priced rental units return to the market, we also need to ensure that new student housing has minimal impacts on surrounding neighborhoods,” she said. However, some residents at the adjacent Harbor Point on the Bay have expressed concerns about a sudden influx of full-time college students beside the mixed-income development. The dormitories are the first phase of what the university expects over time will be 2,000 units of student housing at UMass Boston. Such residence halls are considered a key to better learning, university officials said. The university has experienced robust growth in the past decade, with enrollment expanding to 17,030 students from 11,862 in 2005. UMass Boston officials said they plan to meet again with nearby civic associations in the next few months to discuss development plans. The dormitory will be built through a public-private model that will be the first of its kind in the UMass system. Under the arrangement, the university and Capstone Development will join forces to create a nonprofit organization whose mission will be to provide affordable housing to UMass Boston students. In addition to the 1,000-bed dormitory complex, the first phase of the master plan includes a science complex, which opened in spring 2015; a general academic building, whose construction began in February 2013; and the Edward M. Kennedy Institute for the United States Senate.